I’ve seen (and bought) my fair share of Star Wars gadgets and toys. But the guys from FliteTest have taken Star Wars gadgets to a whole new level. They built their own giant Death Star drone to recreate the attack scene. But this one has a slightly different flow and ending, and if you are on the Dark Side, you will shed a tear of joy. As the FliteTest crew says, they wanted to celebrate the release of the latest Star Wars movie Rogue One. And what’s a better way of doing it than creating something Star Wars related? 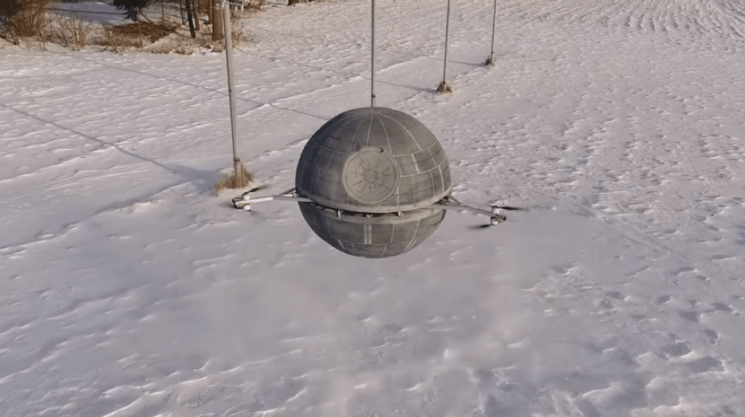 They chose to build a giant and fully operational drone shaped as Death Star. To make everything even more genuine and interesting, they used a fleet of Star Wars drones by Propel to recreate the attack scene. They also built their own replica of Alderan, thought they didn’t seem to put that much effort in it (at least for the exterior). I think they had the ending of the Episode IV in mind at the beginning of their video, but they developed it into something else. And all of you Siths out here will probably like how the video ends. But does it hold the weight of Casey Neistat?